Freezer-on-top is the traditional design of the fridge you grew up with. Why was the freezer always on the top? Because it always was, that’s why. There was never a real reason that refrigerators could not be redesigned to have the freezer on the bottom but that’s the way they were and still are made. One potential reason was that the average person was a little shorter and thus wanted all of the refrigerator space more available. 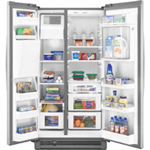 Freezer-on-top refrigerators today are the most economical cost effective models. They generally range from 30 to 33 inches in width and up to 22 cu. ft. of storage. Obviously on of the big drawbacks is having to bend over to pull out the bottom drawers. And some may have trouble reaching the back of the freezer. The look is also “old school” and not updated. 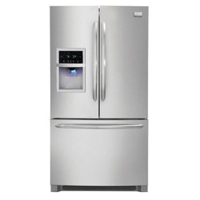 Freezer on Bottom refrigerators offer more high end models and features and many different styles such as french-doors on top as well as one door on top. There are also the new 4-door refrigerators with a middle drawer between the french doors and the bottom freezer drawer. They are typically much more expensive. French-door, bottom freezer refrigerators are the fastest growing portion of the market and offer an updated appearance. They are usually quite a bit more expensive and are produced primarily in stainless steel. Obviously, the refrigerated goods are optimized at eye-level.